If you take birth control pills, it’s important to understand how oral contraceptives can affect your hormone balancing, your liver, your thyroid, and your brain. This functional medicine viewpoint can help you make an informed decision about contraception, or give you insight into buffering potential consequences. Birth control pills flood the body with an unnatural amount of hormones that are also synthetic. This can imbalance the body in a number of ways. Your body’s hormone balance depends on finely nuanced communication between the brain and the hormone glands. The brain determines how much hormone the glands should produce based on hormone activity in the body. When you introduce hormones into the body, this tells the brain the body has plenty of hormone. As a result, the “feedback loop” of communication between the brain and the hormone glands slows down or becomes dormant, lowering the body’s natural production. This may create symptoms or problems when the time comes to go off the pill. Excess hormones can stress the liver as it must break down those hormones for elimination. Chronically overburdening the liver causes it to become sluggish and congested, increasing the risk for inflammation, high cholesterol, and poor immune function. Also, when the liver cannot properly detoxify estrogen, the hormone goes back into the bloodstream in a more toxic form, raising the risk for breast cancer, endometriosis, premenstrual syndrome, fibrocystic breasts, ovarian cysts, cervical dysplasia, and endometrial cancer..
Functional medicine support of liver detoxification may include the use of compounds such as dandelion extract and milk thistle extract to help mitigate these effects. Taking birth control pills can result in depletion of methyl donors. Methylation is a liver detoxification process in which a methyl group, which is a carbon atom attached to three hydrogen atoms, essentially tags a toxic compound so that the body can eliminate it. About 20 percent of the population are already slow methylators. 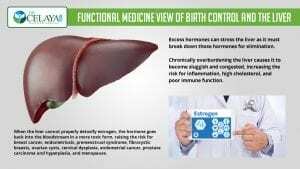 Taking birth control pills can compound this problem, making it more difficult to detoxify environmental compounds. Methylation defects have also been associated with an increased risk of breast cancer. 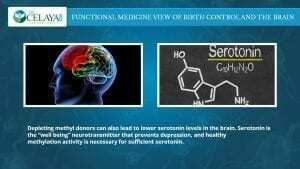 Depleting methyl donors can also lead to lower serotonin levels in the brain. Serotonin is the “well being” neurotransmitter that prevents depression, and healthy methylation activity is necessary for sufficient serotonin. Compounds that can support methylation include methyl B12, P-5-P, MSM, and trimethylglycine. Compounds that support serotonin activity include 5-HTP, St. John’s Wort, and SAMe. Elevated estrogen from birth control pills can cause symptoms of low thyroid function by hindering conversion in the liver of inactive thyroid hormone (T4) to the usable form (T3). Elevated estrogen can also create too many thyroid-binding proteins, which prevent thyroid hormones from getting into cells. Both these mechanisms can cause symptoms of low thyroid activity, or hypothyroidism. The more publicized risks of oral contraceptives include heart attack, stroke, and venous thromboembolism, however these risks are recognized as being minimal. The purpose of this article isn’t to scare you, but simply to educate you in the ways birth control pills can affect your health so you can make an informed decision or understand how you may be able to mitigate their effects. Although certain nutritional compounds may be helpful, it’s also important to use an anti-inflammatory diet and lifestyle approach to optimize the function of your body and reduce risks. Ask my office for more advice on healthy hormone function.